Grey Gum quartzite got its name because of the muted grey/green colours of Eucalypts. This stone is the most popular choice for use in any outdoor location and especially around pools because of its high resistance to salt attack and its safe, "grippy" surface when wet. It is one of the world's finest paving stones. It is a strong and very dense stone with low water absorption rates which make it very serviceable and extremely durable. Bullnose coping - 400x400x25mm, 400x400x30mm. Grey Gum marble / quartzite was also available in a random pattern format as shown in the image on the right. 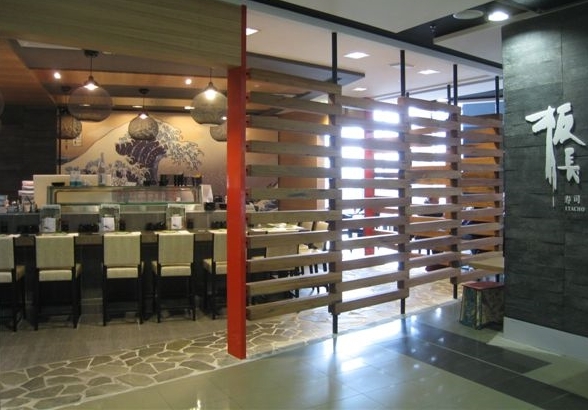 This has been taken at the recently completed Itacho Sushi Restaurant at Sydney Airport. The impressive and very modern design was created by Melbourne architects Baenziger Coles who used the stone in the higher traffic areas of the restaurant to delineate a pathway around the table settings. The choice of stone for the purpose was impeccable; grey gum is a very dense stone and is very serviceable and extremely durable. The random pattern is available (by special order) on netted sheets each of which is just over 0.3 square metres in size. Each sheet fits perfectly with surrounding sheets. The edges are dressed. GREY GUM - MARBLE OR QUARTZITE? Recent test results indicate that the level of quartz in this stone has fallen below the ASTM standards to be technically a marble, even though it looks like quartzite and cleaves like quartzite. So, technically it is marble but it sure looks and feels like quartzite. In the future, we may get dispatches from the same quarry with lower levels of calcite which might make the stone technically a quartzite. Sometimes the changes are not apparent and that is why we get the stone independently tested. Our apologies for the possible confusion - we are just trying to be truthful is describing one of our most popular products that we have been selling for nearly 20 years without a single recorded problem. This stone is the most popular choice for use around pools because of its high resistance to salt attack and its safe, "grippy" surface when wet. It is one of the world's finest paving stones.